Multipro Bassinet is recalling about 1,000 bassinets that fail to meet the mandatory federal safety standard for bassinets and cradles, posing fall and entrapment hazards to babies. 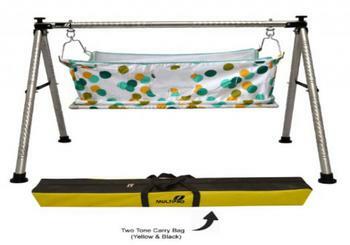 This recall involves Multipro bassinets, an Indian style baby cradle with a swing framework and a pair of metal legs on the ends of the middle rod. The Cradle N Swing is designed to swing the child back and forth in a bassinet, which is made of polka dot fabric with a mesh opening on the side. The bassinet portion attaches to a plastic frame base and is sold in a variety of colors with Multipro written on the outside of the storage bag. The bassinets, manufactured in India, were sold on www.Amazon.com from January 2014, through July 2017, for between $20 and $230. Consumers should immediately stop using the Multipro Baby Cradle N Swing, disassemble it and throw it away. Customers who purchased the product on Amazon.com have been contacted directly and automatically issued a gift card refund for the full purchase price of the product. Consumers who purchased the recalled product on Amazon and do not receive direct communication, should contact Amazon toll-free at 888-280-4331 anytime or online at www.amazon.com.